When it comes to marketing strategy goals, increasing the number of leads or sales prospects is the primary goal for the majority of marketers. According to new research from Ascend2, 45% of marketing influencers believe that the primary objective for a marketing strategy is to provide sales with more leads. 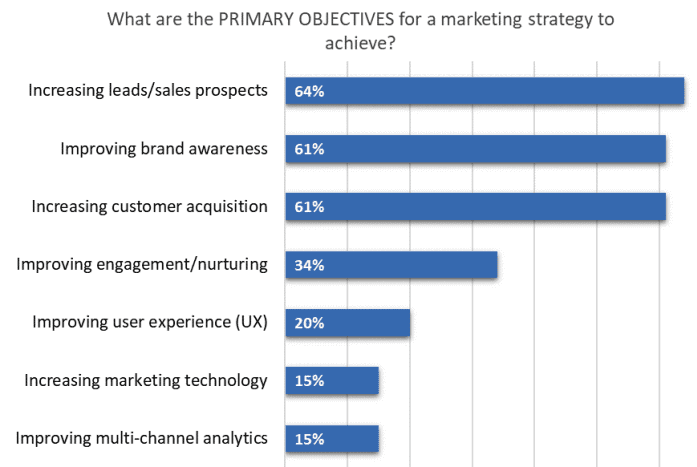 Other popular marketing strategy objectives according to the survey ‘Marketing Resource Effectiveness’ were to improve brand awareness and increase customer acquisition, which both came in at 61%. Just over a third (34%) of respondents thought that improving engagement and nurturing was a primary objective for a marketing strategy to achieve. At the bottom of the table of objectives were improving user experience (20%), increasing marketing technology (15%) and improving multi-channel analytics (15%). The results show that the ultimate point of successful marketing is sales and improving ROI. It can be argued that improving brand awareness and customer acquisition are a part of this – perhaps why these objectives also scored high in the results. While these results show that marketing needs to have sales in mind in order to meet the objectives of a strategy, it also highlights the importance of having both teams work well together. After all, sales with have beneficial insights in terms of the types of leads that are needed and the main customer pain points, while marketing will understand how to attract these. Aligning the objectives of your marketing team with other areas of the business is likely to improve performance and provide valuable and actionable insight. 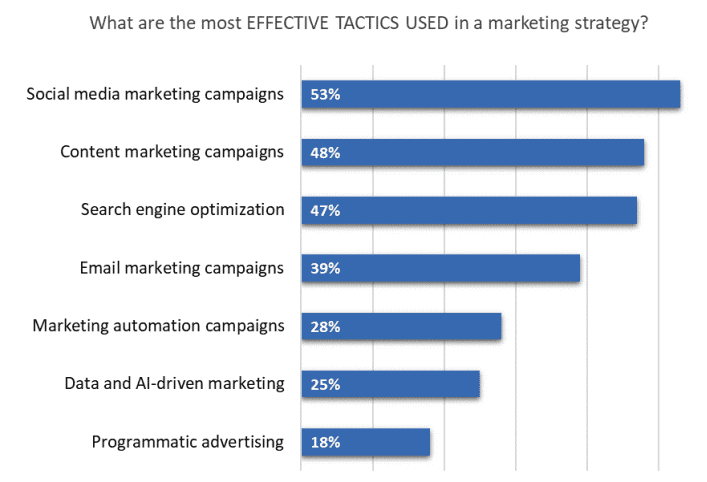 How effective are marketing strategies? Knowing what the objectives for your marketing strategy are is only one part of the larger picture, as you also need to create a full strategy that is successful. Luckily, the survey found that most marketing influencers believe that marketing strategies are successful at achieving primary objectives. 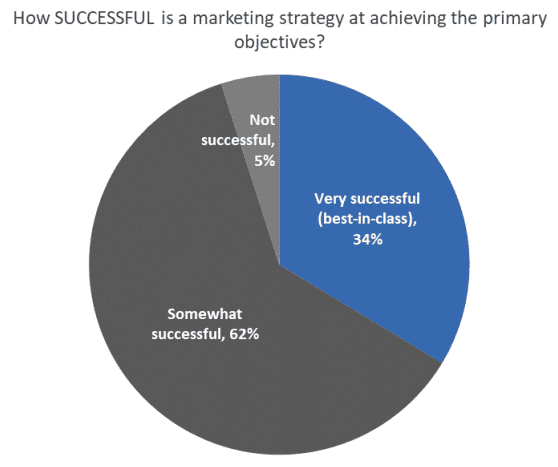 In fact, only 5% of respondents said that a strategy is not successful in achieving objectives. Over a third (34%) said strategies are very successful, while 62% said they are somewhat successful. But exactly how are these successful strategies created? According to the survey respondents, planning is important. However, only using the resources within in your team isn’t necessarily going to allow you to plan the best marketing strategy. Some 73% said that they use a combination of in-house and outsourced resources to plan their strategy, showing that success really is all about making use of all resources available. 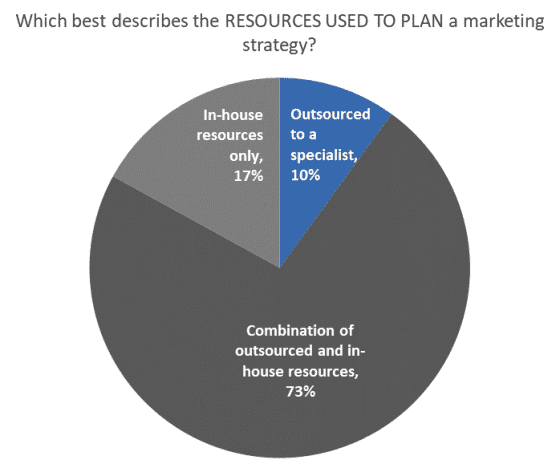 Only 17% stuck with in-house resources while 10% outsourced their planning to a specialist, suggesting that while some companies may have more internal resources, some companies are still struggling on without the marketing expertise and resources that could be really beneficial. 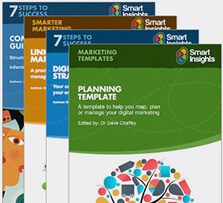 As well as planning and making use of the right resources, the tactics used can also have a big impact on the success of a marketing strategy, which is why you want to ensure you’re using the most effective tactics at your disposal. According to the marketing influencers included in the survey, the most effective tactic you can use is social media. Over half (53%) of respondents said that social media marketing campaigns are the most effective options they have, showing that the rise of social isn’t slowing down and that having a separate social media strategy for general marketing activity is a good overall strategy. The next two tactics considered to be effective came in very close, with 48% of people citing content marketing as a good option while 47% said search engine optimization is effective. Both of these tactics go hand-in-hand, with content that is keyword and topic focused helping to improve SEO performance, so it is no wonder they were both such popular choices. Despite the potential high ROI of email, only 39% of marketing influencers said that it was the most effective tactic used in a marketing strategy. This is perhaps due to the high number of emails people receive on a daily basis, showing that it is becoming increasingly difficult for brands to stand out within overcrowded inboxes. Other tactics that were deemed to be successful were marketing automation (28%), data and AI-driven marketing (25%) and programmatic advertising (18%). The apparent low effectiveness of these tactics could be tied to how difficult they to deploy or are seen as being. 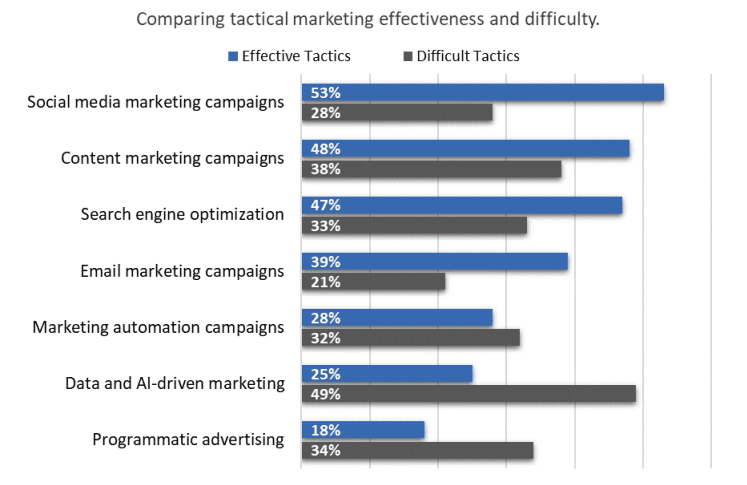 The apparent effectiveness of marketing tactics could be related to the time that it takes to deploy them, with tactics that are more difficult being seen as less effective due to the resource they require. 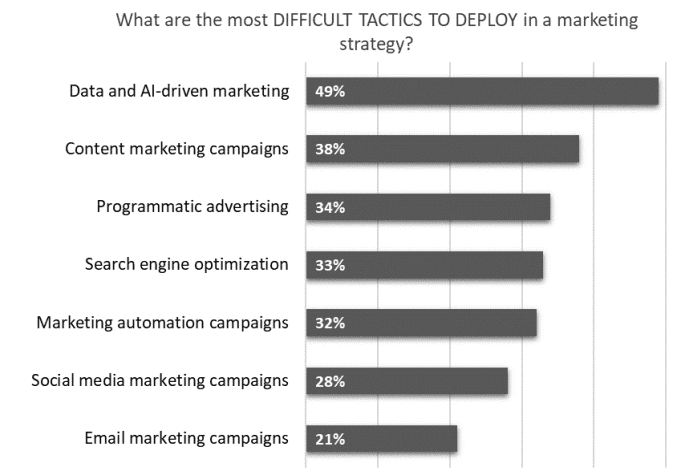 This could be why data and AI-driven marketing were said to be one of the most difficult tactics to deploy in a marketing strategy by almost half (49%) of respondents. While, arguably, data and AI-driven marketing can deliver good results when used as part of your marketing strategy, they do take time and expertise to perfect. This is one of those occasions when outsourcing to a specialist could allow you to reap the rewards and better meet your overall objectives. Perhaps surprisingly, content marketing was the second most difficult tactic to deploy according to the survey, with 38% of respondents agreeing with this. Again, this is possibly due to the time commitment that high-quality, varied and well-researched content takes to create. It is no longer enough to create one type of content that is stuffed with keywords. Marketers need to take into account SEO, competitors, the most engaging content types and promotion of that content. Some forms of content – such as infographics and video – can take a lot of time to produce and require specialist skills. However, with 48% saying that content marketing campaigns are one of the most effective tactics used within a marketing strategy, it seems that the hard work really can pay off. No matter what your primary objective is for your marketing strategy, there are a huge number of methods, tactics and resources that you can use in order to meet them. In order to make the most of all of these and get the best ROI and overall results, the planning process really is, arguably, the most important part of your marketing strategy. Knowing what you are doing, when you are doing it and why you are doing it should help you achieve your objective, whether it’s increasing leads or raising awareness of your brand.